The taskbar by the way is the strip that normally rests along the bottom of the screen. The right side of the strip is home to the clock and at the left rests the Start button. The Start button that is the skeleton key to the Windows operating system. For most users, Windows without the Start button is like a garage without the door opener, or a big screen TV without the remote. Sure you can pull the garage opener rip cord and lift the door manually, or get off the couch to fumble around the TV set for the channel up button, but really, are those even realistically workable alternatives? The first time I lost the taskbar it was like someone lead me deep into a library, turned off all the lights, and then told me not to worry since the instructions for turning on the lights were laying on a table accross the room near aisle Pachyderm – Qwerty. There is some good news. The taskbar never really disappears, it only hides, and only on our command. I have accidentally moved the taskbar to another spot on the screen and that can be a problem too. My problem was that I did not know that I was the cause of the taskbar relocation. In an unrelated fit of frustrated flicking I grabbed the taskbar itself and slammed it up against the right side of the screen. I actually had to go online and search for a solution. It took a while too. There were far fewer troubleshooting sites in the early 90’s. Not so many charitable souls offering genuine guidance; in return for higher Google search rankings to drive banner ad revenues. Well I finally found a webpage on which somebody left instructions to just click and hold the taskbar then slide it right back down to the bottom of the screen. Doh! Taskbar is Covered Up Part I: Web browsers and most other programs have a full screen or Kiosk Mode that allows the active window to use the most possible screen space.There are several ways to recover from an accidental use of this mode. The simplest is to hit F11 atop the keyboard. Try it now to see what I mean. This effect once (or twice) caused me great tribulation over vanishing toolbars at the top of MS Word/Excel. How do I click View/Show Toolbars when the View button is not up there anymore? Vivid memory that one. Stupid F11 key. Taskbar is Covered Up Part II: If the program is not in Kiosk Mode, and the taskbar is still missing, it may still be behind other windows. Starting with Windows 95 programmers added a configuration feature to keep the taskbar visible that we’ll call Always on Top. Even if you opened a window to full screen mode the bottom of that window would be tucked behind the taskbar. Taskbar always on top. That feature is selected by default in Vista but Microsoft eliminated the option in Windows 7. The taskbar is always on top in Win 7 and there is no checkbox to uncheck. Under the Who The Heck Cares column: Gamers found fury in that the bottom of their screen, many times containing the controls of the game, was covered by the always on top Windows taskbar. Game developers created a stronger full-screen mode for the win. Thankfully this mode also stopped mail notifications and “updates are ready for your computer” messages from popping up and minimizing your game screen, just when your character had stepped into a fierce Goblin camp that took your group two hours to fight your way up to, leading to certain player character dismemberment behind a black monitor screen. 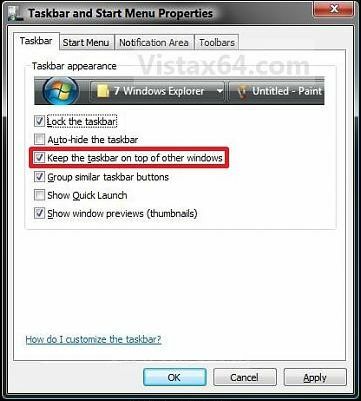 For the readers using Vista and prior versions: Right click on an empty area of the taskbar and click on Properties. Check the box next to Keep The Taskbar On Top Of Other Windows. 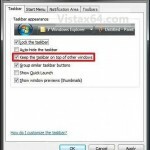 Taskbar Auto-Hide is Enabled: Some people would rather the taskbar be hidden when not needed. Since disabling the Always on Top feature is no longer an option, after Vista versions, the old auto-hide feature can still be used instead to minimize the taskbar. This works well for very small screens that need all the real estate available; or if you like a clean desktop appearance. However, if you prefer to see your Start button, quick launch icons, clock, alerts, open program tabs etc., then any feature that includes hiding is not a happy option. Here we go: Right-click the taskbar and click Properties. Select the Lock The Taskbar check box. Verify that the Auto-hide check box is not selected. Hello, I Have No Taskbar To Right Click: It has not escaped me that two of my solutions require a right-click on the taskbar; the possibly missing taskbar. Devilish to leave this tip till number four but that’s the way the words rolled. On the keyboard there is a special key, usually towards the lower left between Ctrl and Alt, on which the Windows logo is printed. That key does not seem to do much at all. It just causes the Start Menu to pop up and down. The Start Menu that is normally popped up by clicking on the Start Button. The Start Button that is attached the missing taskbar. Press the Windows key. Click on Control Panel. Click on Appearance and Personalization. Click on Taskbar and Start Menu. The window seen in the image above will allow you to follow the instructions from number 2 and 3. If you have a missing taskbar which these solutions will not help restore just use the reply feature to send me a private message, or use the comment box below the post to publically call me out, and I will include the fix right away. This all reminds me of the time I unknowingly hit the laptop F-key that tells the computer to send everything on the built-in screen to an attatched external monitor. I remember wondering where it all went went, mouth open, eyelids blinking, arms outstretched in the universal “what the Hell just happened” pose. Then more wondering about how to switch it all back when the laptop’s own screen was a blacked out clueless riddle? Luckily, several years earlier, someone at the factory had drawn a little picture of a laptop next to a TV monitor right on one of the F-keys for me. Otherwise I would have had to read the manual. Yeah right. This entry was posted in Troubleshooting and tagged Repair, Taskbar, Troubleshooting by Steve. Bookmark the permalink. I just want to tell you that I am very new to blogging and site-building and absolutely loved you’re website. More than likely I’m going to bookmark your blog. You really write wonderful articles. Thanks for sharing with us. Thanks Trenton. Let me know if I can help.